Do you want to explore S/4HANA? Together with Detaysoft, support the digital world’s latest technologies including IoT, Big Data, Machine Learning, Blockchain, Business Networks, Social Networks, Human Capital and Mobility on a single platform with SAP S/4HANA, and gain speed and increased efficiency with new user-friendly interfaces. See what our customers and us tell about digital transformation with SAP S/4HANA. 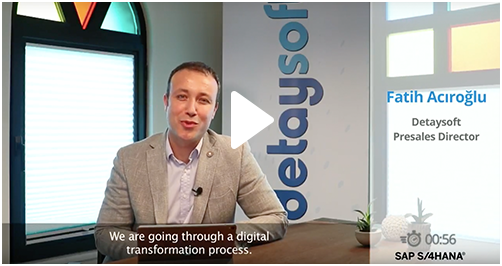 Tayfun Yiğit, INDEX Grup CIO shared his experiences about S/4HANA, while Fatih Acıroğlu, Detaysoft Presales Director told about the capabilities of the solution and answered the questions.